Trip Log – Day 362 – Oklahoma City OK | How Will We Live Tomorrow? There are two truths I run up against everywhere I go: our public education system is failing; our public library system is thriving. To paraphrase Dallas Police Chief’s David Brown’s remarks after five Dallas police officers were killed, ‘we ask too much of our public schools.’ We expect our schools to reflect the America we hope for – a place where our children are educated and fed and socialized and integrated; while in reality our culture devalues, often denigrates, education, tolerates hunger, fosters inequality, and remains largely segregated. People argue about funding and teacher salaries, unions and charters. But ultimately our schools are failing because they are not supported by the society they are supposed to prepare our children to enter. Teachers feel beaten down and unappreciated, parents feel shortchanged; taxpayers are unwilling to pour money into a floundering system. Our public libraries, on the other hand, are the most well utilized democratic institutions in our country. Libraries allow everyone, regardless of race or income, to access the information and technology necessary to be an informed citizen. I’ve visited hundreds of libraries across the country and am amazed at how well they’re used. Patrons respect these facilities. Librarians are consistently positive and helpful. I’ve observed librarians help non-English speaking adults navigate the Internet, assist transients in obtaining identification, and coordinate a line of homeless through the men’s room with patience and respect. They are not just reference sources; they are our new social workers. 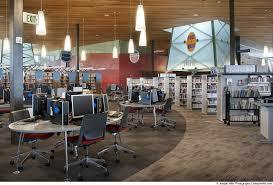 I spent most of the day at the new Patience Latting Library in Northwest Oklahoma City. When I arrived on a weekday morning most of the computer terminals were already occupied and I landed the last available study carrel. The 35,000 square foot, LEED building that opened in 2012 buzzed with purposeful inquiry. It’s bright interior is rich in Oklahoma imagery: skylights that evoke oil derricks on the roof top identify key elements of the open plan interior. The $8.2 million facility cost is less than one quarter of this year’s Oklahoma City Schools capital budget. The schools don’t seem to get comparable bang for their buck. Libraries are not schools. They are elective rather than mandatory use facilities. But I can’t help thinking what make libraries so wonderful – that they serve across generations, that they invite independent inquiry, that they are staffed by people who support the patron’s interests rather than deliver prescribed content – are ingredients we ought to stir into our efforts to revitalize our schools. 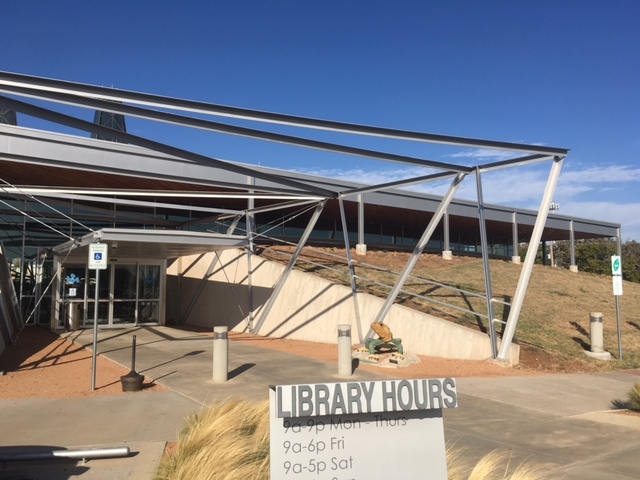 This entry was posted in Bicycle Trip Log and tagged Northwest Library Oklahoma City, Oklahoma City, Patience Latting Library, public libraries. Bookmark the permalink.